TRAVEL.org - South Carolina. Find Resorts, tours, travel agents and activities in SC. Myrtle Beach Golf Packages - Offers golf tours and vacation packages in Myrtle Beach, South Carolina. Hilton Head 360 - Hilton Head Island Vacation Rental and Real Estate Guide. Search hundreds of vacation rentals, all with virtual tours. Vacation Company - Hilton Head Island vacation rentals. Private homes and villas located island wide. Folly Beach - Official guide to the beach on the "Edge of America". Myrtle Beach Convention and Visitor's Bureau. Condo Lux of Myrtle Beach Condo Rentals - We offer luxurious Oceanfront Myrtle Beach Condos and Beach Home Vacation Rentals. Best Western Sea Island Inn - Stay in the heart of the Beaufort Historic District and explore the antebellum homes, plantations, and secluded islands of South Carolina's Low Country at our charming Beaufort hotel. Captains Quarters Resort - Surf and golf specials abound at this wonderful family resort in beautiful Myrtle Beach. Stay for a week, or stay for a few days, and design the perfect vacation you need to fit your time, budget, preferences and level of activity. Elliott Beach Rentals - Myrtle Beach Vacation Rentals are as wide ranging as the 60 miles of beachfront that comprise the Grand Strand. North Myrtle Beach Golf - We offer Myrtle Beach Golf Packages and Accommodations including oceanfront condo rentals. Fairfield Inn & Suites Columbia Northeast - The Fairfield Inn & Suites by Marriott hotel is perfect for business travelers 5 minutes from Fort Jackson, Blue Cross Blue Shield, Providence Hospital, SCDHEC, & Palmetto Health. Located in NE Columbia conveniently off of SC I-77 & SC I-20. Renaissance Charleston Historic District Hotel - The Renaissance Charleston Hotel in South Carolina is the newest upscale property located in the Historic District of Charleston, the city's oldest quarterand boasting boutique accommodations and luxurious amenities. Courtyard Charleston Waterfront - Enjoy our downtown Charleston, SC hotel's breathtaking views of the Ashley River and marina. The Courtyard Charleston Waterfront features a 24 hour Market, fitness center, and relaxing lounge. Courtyard Charleston Historic District - Discover one of the newest downtown Charleston hotels ' Courtyard Charleston Historic District. With spacious guest rooms, state-of-the-art event space, a restaurant and more. Courtyard Myrtle Beach Barefoot Landing - Get away to a hotel in North Myrtle Beach that's just steps from Barefoot Landing and the city's top attractions. Relax in one of our 157 spacious rooms, which feature a spacious work desk, two telephones, and wireless high speed internet. Charleston Marriott - Discover one of the most luxurious hotels in Charleston, SC - the Charleston Marriott hotel. Our accommodations boast spacious guest rooms, a variety of on-site restaurants & 50,000 sq ft of flexible event space. Myrtle Beach Golf Resorts - Upscale, luxury resorts in gorgeous Myrtle Beach. Plush furnishings and decor, amenities that will give the vacation you are longing for, whether restful or full of activities. Packages and specials to go easy on the budget-concious vacationer who does not want to skimp on value. Staybridge Suites North Charleston - This newly built hotel offers a superb array of amenities and residential-style accommodations with full kitchens. At our all-suite hotel, enjoy free hot breakfast, indoor swimming pool, complimentary wi-fi, plus rides to Charleston Int'l Airport and downtown Charleston on our courtesy shuttle. Marriott Myrtle Beach Resort & Spa at Grande Dunes - This beachfront resort in Myrtle Beach, South Carolina, features 405 guest rooms, 45,000 sq. ft of meeting & event space, on-site dining, golf, tennis, fitness center, a pool with a waterslide and more. Affordable Myrtle Beach Vacation Rentals - Dunes Realty offers affordable vacation rental homes in the Myrtle Beach area in Gardenm City Beach and Surfside Beach. Staybridge Suites Columbia - This newly built hotel offers residential-style living with fully equipped kitchens, living rooms, flat panel LCD TVs and free wireless high-speed internet. The hotel also offers complimentary hot breakfast, 24-hour fitness center and indoor pool, business center with remote printing, and a manager�s reception on select evenings. 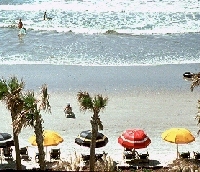 800Beachme.com - Hilton Head Vacation Rentals with villas, homes and condos island-wide. Hilton Head Island Marriott Resort & Spa - This beachfront resort on Hilton Head Island features three on-site golf courses, a full spa, 25 tennis courts, and 43,000 sq ft of meeting and event space. Marriott�s Grande Ocean - Situated on the brilliant beaches of Hilton Head Island is Marriott's Grande Ocean. Surrounded by unrivaled amenities, enjoy the comfort of your two-bedroom, two-bath villa with a master suite, spacious living and dining areas, and private balcony. A better Stay - Vacation Rentals in Myrtle Beach - Booking vacation rentals, condos, resorts, hotels and more at reduced prices. ABetterStay.com, the starting place for a better vacation. Marriott�s Barony Beach Club - Tucked along the beach within Hilton Head Island's acclaimed Port Royal Plantation is Marriott's Barony Beach Club. Retire to the elegant setting of a spacious two-bedroom, two-bath villa with living and dining areas, private balcony, and full kitchen. Marriott's OceanWatch Villas at Grande Dunes - Along South Carolina's Grand Strand in Myrtle Beach is Marriott's OceanWatch Villas at Grande Dunes. Discover comfort in spacious two-bedroom, two-bath villas featuring a private balcony, splendid views, a master suite and a full kitchen. Myrtle Beach Rental Places - Vacation Rentals - Beach Vacation Homes, Villas, Condos and House Rentals in Myrtle Beach, South Carolina. Professionally Managed Vacation Rental Accommodations. The Inn at USC - on the campus of the University of South Carolina in Columbia, the Palmetto State�s capital, features tastefully decorated guestrooms and suites in a unique setting near dozens of local attractions. Isle of Palms Vacation Rentals - Beach Vacation Homes, Villas, Condos and House Rentals in Isle of Palms, South Carolina. Professionally Managed Vacation Rental Accommodations. Kiawah Island Vacation Rentals - Beach Vacation Homes, Villas, Condos and House Rentals in Kiawah Island, South Carolina. Professionally Managed Vacation Rental Accommodations. Seabrook Island Vacation Rentals - Beach Vacation Homes, Villas, Condos and House Rentals in Seabrook, South Carolina. Professionally Managed Vacation Rental Accommodations. Wild Dunes Vacation Rentals - Beach Vacation Homes, Villas, Condos and House Rentals in Wild Dunes, South Carolina. Professionally Managed Vacation Rental Accommodations. Hilton Head Hotels and Accommodations - Discounted rates on Hotel rooms, Car Rentals, Flights, Vacation Rentals. Discountedhotels.com, your complete travel resource. Middleton Place - a National Historic Landmark and a carefully preserved 18th-century plantation. Sunset Rentals - How about Going Golfing at Hilton Head? Check the site for the latest specials on vacation homes, villas and condos, including our golf packages.